Take the FREE Flex Test! Nobody has a perfect golf swing – simply because nobody is perfect. Yet it seems like many golfers are trying to achieve a perfect swing, despite having muscle imbalance in their bodies. On this note, nearly all golf instruction is geared to get golfers to swing a certain way and in most cases ignore the individual’s physical limitations – or, muscle imbalances. Having studied the body and the golf swing virtually all my life, I’ve found that by correcting a person’s muscle imbalances, they’ll automatically improve their golf swing, and the swing flaws they have usually diminish or go completely away! In today’s newsletter, I’m enclosing EIGHT of Golf’s most common swing faults, and explaining how muscle imbalances (or lack of flexibility) is causing them, AND then prescribing a few easy to do stretches and exercises to address each fault. 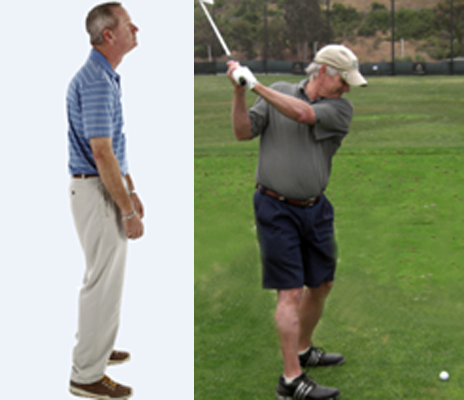 Good golf begins with good posture, and all good instructors try to get you into good posture in the address position. BUT WAIT A MINUTE! How can you get into good posture in the Address Position, if you don’t have good posture? Do these exercises in sequence and in time, you’ll be able to achieve much better posture. A poor takeaway (most commonly the “Yank” to the inside); results in compensations throughout the swing. This stretch sequence addresses the anatomical dysfunctions that cause the poor takeaway in the first place. You’ve got to be Hip! Pelvic Rotation is THE most important motion in the golf swing – PERIOD! If your hips are tight, the odds are, they’re not going to rotate properly. This sequence will help free up your hips and allow them to move with effortless power. Every body wants a bigger shoulder turn, but the majority of golfers are tight in their shoulders. Until now, that is. Follow this sequence – from the ground up – and you’ll gain more range of motion – and power- throughout your swing. Get rid of that Chicken Wing once and for all! By following this sequence, you’ll help loosen up the tightness in the areas of your body, that are causing the arms to crash into your torso. Get rid of Golf’s most common problem – Over The Top, by following these simple stretches in order. Then, practice the Golf Swing Drill and get rid of that over the top move once and for all! The legs stabilize and allow the hips to function. However, tight hams and quads will restrict the entire body and allow the body to “Get Stuck”. This sequence will loosen up your legs, which will allow you to stay down and through the shot. Hitting from the top is normally caused by the improper kinematic sequencing of the body on the downswing. Instead of the Hips, Thorax, Arms, and Club, leading, we usually see the Club, Arms, Thorax, and Hips in the wrong order. Why? You guessed it. Restrictions in flexibility in the muscles. Not any more if you follow this sequence. Get Roger’s Secrets to a Flexible Golf Swing™ and start improving your Flexibility and Swing today!